Snapchat is known for its disappearing images, but as more services such as WhatsApp and Instagram take on the idea, Snapchat is now best known for its augmented reality lenses and filters. These allow you to distort your face, look stupid in front of friends, show off your location and even transform your face for all of your followers. It’s one of the best parts of the service and if you haven’t been using them already, you’ve been missing out. Here we’ll teach you exactly what Snapchat filters and lenses are, how you can find them on your phone and why you should start using them. What are Snapchat filters and lenses? 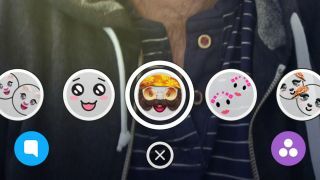 Snapchat lenses are augmented reality filters - you'll typically find these on the selfie camera, but some are available on the rear - within the Snapchat app. You'll want to use these to make your face look like a dog or give yourself a strange hairstyle. A Snapchat filter meanwhile can be used to change the color of your image like on Instagram, while some add information such as your location, the time or even the weather in your current location. To use a Snapchat filter, you'll have to take a photo on either of your phone's cameras and swipe left or right once you've taken the image. It'll cycle through some of the photo filters available to you, including options that pull through the current time and your current speed. You do get different ones depending on whether you're sharing an image or a movie. In the case of a movie you can apply fast-forward and slow-motion effects, for example. As you swipe right, you'll also see any geofilters that are available - these overlays cover famous locations and cities, and most big urban areas now have a filter of their own. As users can submit their own, a lot of smaller places will have one as well. You're also going to come across geofilters for specific events, like popular sports games or music festivals and so on. It's hard to say exactly when you will find a topical geofilter and when you won't, but it's always worth having a look. Sometimes the filters you can see vary between Android and iOS, in case you're wondering why you can't access all the ones your friends can. Here's a little trick to try: with one filter applied, tap and hold on the screen (as if you're holding the filter in place), then swipe right again and you can apply a second Snapchat filter. It's not possible to combine all of the available filters in this way but you can, for example, put the time on screen and make your picture black and white at the same time. In fact, you can tap and hold and swipe again to apply a third filter, depending on the type and position - in the case of videos you can add up to five, should you need overlays, color adjustments and a funky speed effect at the same time. Snapchat has for some reason hidden the lenses section within its app and if you don’t know it’s there, it can be hard to find. The trick on both iOS and Android apps is to hold down on your face when in selfie mode. Press down on the screen for 1-2 seconds and you’ll see a 3D map of your face appear in white. This is tracking where your face is in the image, and from there you’ll see the lenses appear along the bottom of the screen. It’ll start you off without a filter, so you need to scroll to the right to preview the first filter in the list. Snapchat usually has 10 to 20 different lenses available at any time and the selection regularly changes. You'll usually need your face in the image for it to work, but you can also use the rear camera with some lenses and use them on multiple people. How often does Snapchat change its lenses? New lenses appear on Snapchat every few days. It’s always worth having a quick check to see what the latest Snapchat filters are and what each offers you. Remember some will lenses will drop off, so if you want to use them we'd recommend doing it quickly before they disappear. Sadly, Face Swap isn't always available on Snapchat. When it is, it allows you to switch faces with whoever else is in the image and make some fun looking photos. To see whether the filter is available, you'll need to scroll through and look for a logo of two faces with arrows above them. Snapchat has a filter specifically designed for a service called Bitmoji, which will allow your own emoji to appear within a snap. To make your emoji, you'll want to download the Bitmoji app on iOS or Android to create one. You can then connect your account to Snapchat and use the Bitmoji you created as a Snapchat filter. Scroll along within Snapchat lenses to find the Bitmoji option and your new character will appear around the screen. You can also edit your Bitmoji at any time within the Snapchat app by pressing on the face in the top left.